Budding filmmakers - create your HD masterpiece! If you fancy yourself a bit of a Spielberg or Tarantino - if you find yourself yelling "cut!" during your son's football match, climbing trees to get the best angle for your shot or rolling along on a skateboard in order to achieve a smooth panning shot - then you need an HD Digital Camera! Despite the fact that all smartphones, tablets and cameras now have the ability to record video,take photos, sometimes there is just no substitute for the real thing. Our HD Digital Camera allows you to create high-quality HD movies, travel documentaries and music videos with the greatest of ease, even if the starring role goes to your five-year-old daughter while she sings 'Blurred Lines. When filming your masterpieces, you don't want to be weighed down by cumbersome equipment. That's why we've made our Digital camera small enough to fit easily in your bag and light enough that you won't notice it's there! Record easily onto memory cards for unlimited storage. 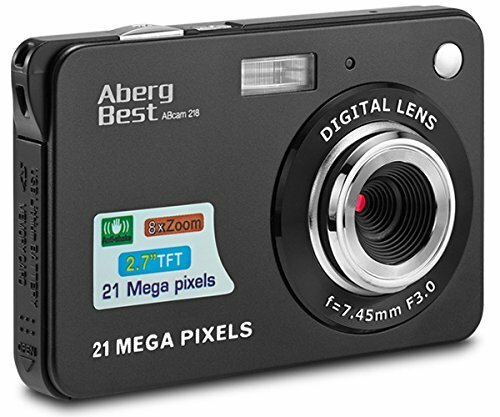 While phones and tablets only give you so much storage space before you have to start deleting footage, the Aberg Best HD Digital Camera records onto SD memory cards that you can easily swap when you want to keep recording or photos. That way you'll be able to film your feature-length documentary about the perils of taking a two-year old on a camping holiday! Please note that external Memory card(SD card) is not included in the package. If you have any questions about this product by AbergBest, contact us by completing and submitting the form below. If you are looking for a specif part number, please include it with your message.